All this sunshine inspired me to add to the heat and challenge you to a summer contest. 1. Create a card with a summer theme. It can be for any occasion but it has to have a summer feel to it. 2. Post about it on your blog. 3. Add your card to the contest to the link at the end of the post. 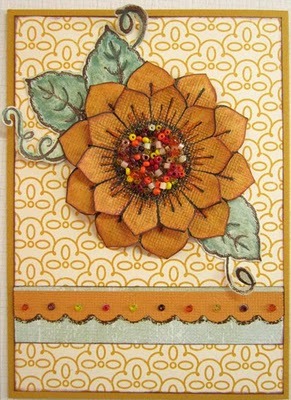 Here is mine, a sunflower card I made for my mom for the Jewish New Year. The contest will continue through out the week. I'll post the winner next Friday. The winner will win a surprise goodie bag! I can tell you it will have ribbons, flowers, stamps, ink, rub-ons, stickers and many more surprises!! It will be a really good goodie bag. Here is a little peek. זה חייב להיות כרטיס, או שזה יכול להיות פרוייקט אחר, כמו מיני אלבום? זה יכול להיות גם משהו אחר! עינת , הכרטיס שלך יפה מאוד!!!! Very pretty card! I love all the beads you used for the center of the flower. Cute! I changed what i said sorry you have a very cute card. thanks for the chance to win. I loved making this card hope u all like it. Posted mine! Thanks for the great inspiration! Hi Einat, I've posted my card, thank you for the chance!! Thank you for the fun challenge/contest! Am LOVING summer right now! Thanks for the chance to win. great giveaway and all the Cards are great. פתאום ראיתי שפספסתי את הפוסט הזה... הנראה לי שנכנסתי ברגע האחרון... ונהניתי ממנו מאוד (-:... שיהיה לך קיץ נהדר!